At a ceremony in Glasnevin, following the dedication of the France-Ireland Memorial, Jean-Marc Todeschine, Minister of State at the Department of Defence with special responsibility for Veterans and Remembrance invested three Irishmen with the Légion d’Honneur, for service in France during the Second World War. The Legion of Honour is the highest French distinction for civilian and military merit presented by the President of the Republic of France. 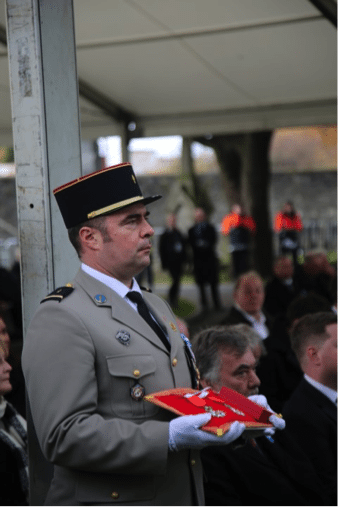 On the 06 June 2014, in Ouisrtreham, French President François Hollande paid tribute to all non-French citizens who participated in the liberation of France in the Second World War. Since then, Irishmen involved in the liberation have been invested with the Legion of Honour. The most recent recipients were Albert Sutton (94) from Clontarf, County Dublin and James Moore (92) from Borrisokane, County Tipperary. Barbara Allshire received the Légion d’Honneur on behalf of her deceased husband Jack. “You are among the last surviving faces in our two countries’ shared memory. It is our duty as Irish and French people to pass on your stories to our children. It is a source of honour and pride for me to come and express to you here, in your own country of Ireland, France’s eternal gratitude. It is a strong, symbolic gesture, but above all it is a gesture of friendship. It is a gesture that France owed you”. 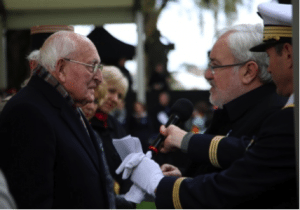 James Moore was born on 05 June 1924 in Borrisokane, County Tipperary and worked as a tailor in the shop of his father Malachy before joining the Royal Air Force in January 1944. Assigned to the Second Tactical Air Force of the Royal Air Force, Leading Aircraftman Moore was involved in involved in the maintenance of aircraft equipment. In July 1994, he landed on Juno Beach and his unit was deployed to the Carpiquet airfield. His final posting was in Bruges, Belgium. After the war, he joined the British Rail before returning to Ireland in 1958. He has two children and three grandchildren and resides with his wife in Coolbawn County Tipperary. Albert Sutton was born on 21 November 1921. A native of Malahide County Dublin, in 1939 he enlisted in the Royal Artillery and later transferred to the Royal Air Force. 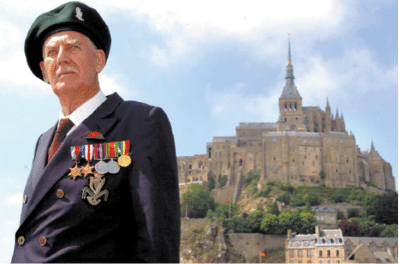 On 06 June 1944, he landed on Gold Beach and deployed with his unit to various airfields in France. Later his unit participated in the liberation of the Bergen-Belsen camp. His final deployment was to Kastrup in Denmark, awaiting movement to support the US Forces in the Far East. Shortly after moving to Kastrup, atomic bombs were dropped on Hiroshima and Nagasaki. Demobilized, Albert applied to join the Garda Síochána, but decided to join the London Metropolitan Police and served in London until his retirement. Albert now resides in Kilternan, County Dublin. His awards include: the D-Day Normandy Landing Medal, the Battle of Britain Medal and the Long War Time Service medal. The son of a soldier in the British Army, Jack Allshire was born on 08 July in Cork. In 1941, at the age of 16, Jackie enlisted in D Company, 2 Battalion Royal Ulster Rifles in Newry, County Down. His unit trained in Invery, Scotland. On 04 June, Jackie’s unit landed on Sword Beach, Normandy with Caen as its main objective. In the vicinity of Cambes, he was wounded but returned to combat. 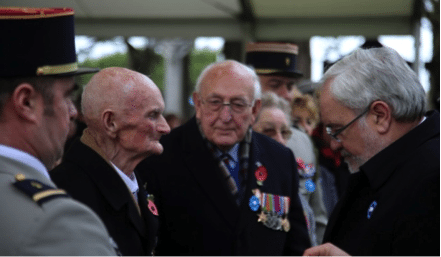 Jackie returned to Normandy on the 60th anniversary of D Day. Residing in Lower Gortroe, Lombardstown County Cork, John (Jackie) died on 02 November 2014. RIP.